Synagogues in Germany hired armed security guards for protection throughout the recent High Holiday season following a surge of anti-Semitism in the country. 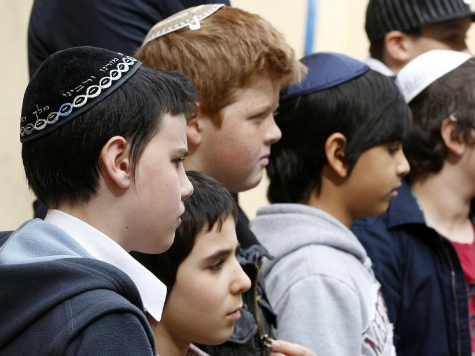 Only last month German Chancellor Angela Merkel vowed to do everything she could “to ensure anti-Semitism doesn’t have a chance”, yet German Jews are once again openly wondering whether they have a future in Germany. October 3rd to 6th marked Yom Kippur, the holiest of the Jewish festivals. Also known as the ‘Day of Atonement’, Jews are encouraged to review the past year’s deeds, ask forgiveness for any wrongdoings and reflect on how to improve themselves in the coming year. It is characterised by a sombre mood, but this year has been especially downbeat as German Jews fear reprisals and attacks, prompting Merkel to promise armed guards for all synagogues. As the war between Hamas and Israel in Gaza flared up again this summer, the conflict was used as the pretext for a number of marches that had a distinctly anti-Semitic undertone to them. Chants of “Jew, Jew! Cowardly pig,” and “Hitler was right” could be heard. Synagogues were attacked, and many more hired ex-Israeli military men to protect their congregations. However, Graumann was adamant that Gaza was a pretext, not the reason for the vitriol, saying “It is cited as a reason for that, but I don’t think it’s a reason. It’s an occasion to let it out. Anecdotal evidence from the UK would also support the idea that anti-Semitism is rife, and perhaps even fashionable amongst the educated liberal middle classes. The Labour candidate for Woking, Vicki Kirby, who was also an active member of the youth wing of the party, was recently suspended by Labour for claiming that “Hitler might be the “Zionist God””. Writing in The Independent, a Grant Feller, a British Jew, tells of his brushes with anti-Semitism at dinner parties and in the office. “These kinds of expressions are not, as Merkel and other leaders would like to think, expressed by agitated Muslims, but by pretty normal white, middle-class people,” he writes, continuing that anti-Semitic remarks are “not the language of the disaffected, unthinking youth or the hate-fuelled yob, but of the otherwise intelligent middle classes who suddenly feel able openly to voice their prejudices. “When a former colleague, in all seriousness, once asked me why “Jews are so good at holding on to their money”, I put it down to old-fashioned idiocy. But then I was helpfully advised in the office that if my fellow Jews and I stopped “banging on” about the Holocaust, we wouldn’t get such abuse. “And then, during a recent work project, I was in a room full of executives who disregarded the suitability of a certain individual because they were foreign. “Well, not foreign, but Jewish,” the boss said. Meanwhile in Germany, the attacks have prompted many synagogues to hire ex-Israeli personnel as protection over the summer, with some earning up to £12,000 a month for their services. One security company manager, an ex-special forces soldier, told The Times that he was getting “50 calls a week” from people seeking protection. “”In Germany alone, several hundred ex-soldiers are charged with the protection of Jewish facilities. In Europe, we speak of thousands,” he said.